The Spro Bronzeye Baby Popper was designed by B.A.S.S. professional fisherman Dean Rojas. 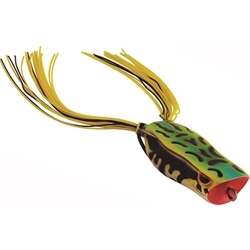 The Spro Baby Bronzeye Popper features a premium 1/0 Gamakatsu double hook, and it comes in many popular fish catching colors. From small lakes, rivers, or reservoirs the small size of the Bronzeye Baby Popper will catch fish in just about any fishing situation!